Davit Arm Inspection and Maintenance? 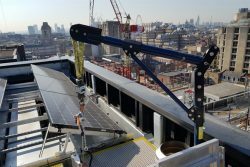 Heightsafe can design, supply, and install bespoke Davit Arm solutions when abseil points do not give you the desired access required for building maintenance – removing the need to have ropes trailing over the edge of parapet capping. Davit Arms are commonly utilised to enable rope access technicians safe access to clean and maintain windows and façades. 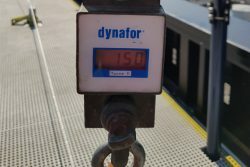 Due to the load capacity that this system can support it is a legal requirement to have them tested twice annually, dependant on frequency of use – this applies to temporary and permanent davits. Offering a comprehensive inspection, testing and certification for all systems, Heightsafe’s specialists are the safe choice when it comes to work at height compliance. As building design and legislation has changed through the years where work at height is concerned, many roof layouts are now more complex and safe access for maintenance is a challenge. To remain compliant with Work at Height regulations, most roofs now feature parapets, guardrails or balustrades of some description, making access more complex when abseil work is required – Davit Arms are the perfect solution. With over 50 years combined experience in the work at height and construction industry, Heightsafe have the privilege to work with some of the largest property owners in the UK. Clients benefit from innovation and technology to put safety above all else – raising the bar for compliance standards nationwide. Get in touch with the specialist team today to discuss reducing your annual PPM expenditure.